← Silent Large Bright White Orbs All Disappeared. Yellow Blinking Light Moved Quickly, Sporadically, Takes Off, Vanishes. Video Clip of Erratic Moving Yellow Light. 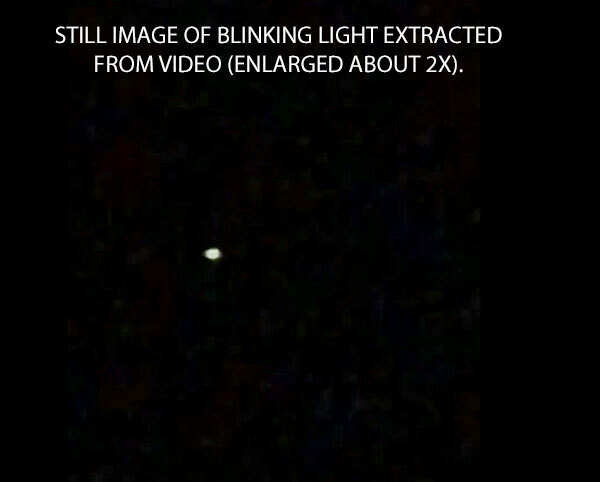 STILL IMAGE OF BLINKING LIGHT EXTRACTED FROM VIDEO. (ENLARGED ABOUT 2X). Description: We saw an object that was high in the sky and only a yellow-looking light could be seen. It appeared to be blinking. The object was moving quickly and sporadically in different directions and then just disappeared after taking off into the sky. My brother was able to capture this video. This is not the first sighting at this location, but is the first time we were able to capture this on camera. This entry was posted in bright light, Orb-like craft, Photos, UFO Sightings 2019, UFO Sightings Georgia, Video Clips and tagged Blinking light, Erratic moving, Yellow colored lights. Bookmark the permalink.